/ Modified aug 13, 2018 4:16 p.m.
Violence in Mexico is a theme in the works of artist Luz María Sánchez. MEXICO CITY — For more than a decade, thousands of people have disappeared in Mexico as a result of crime-related violence. 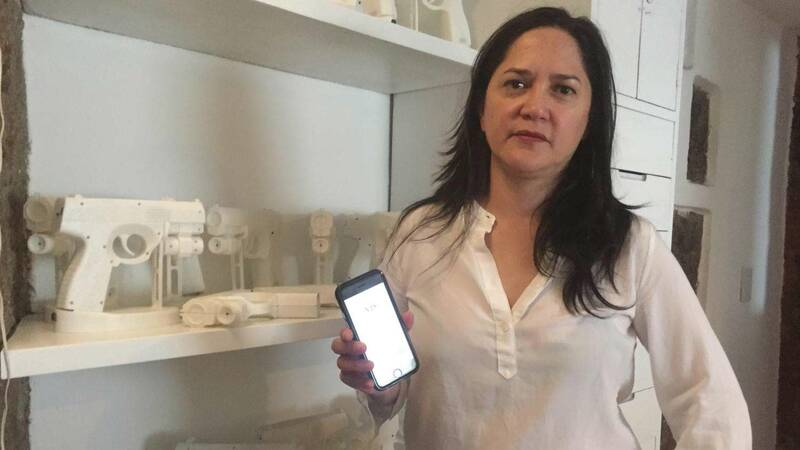 But an artist is helping a group of grieving mothers in their search of their loved ones with an app, and she hopes this technology can also help track immigrants lost crossing the border. Luz María Sánchez is an artist and scholar in Mexico City. She’s not creating objects to be shown or collected, she's creating tools. Sánchez is working with other collaborators on an app to help a group of mothers called Las Rastreadoras del Fuerte on their search for their children. These are victims who were taken by force to be extorted, turned into criminals or killed. “They realized at some point that the police [weren't] doing anything, the government is not backing them up and nothing was moving, so they decided to go out and start looking,” the artist explained. According to Sánchez, Las Rastreadoras del Fuerte have already found more than 100 bodies without any help. But she hopes the new app can bring them more light. “For me, as an artist, the important part of this project was to build a space where these women will feel at ease, will feel at home, for them to share their experience, their grievance, their loss ... or their hope,” Sánchez said. The app uses a map and video to keep track of the group’s search in Los Mochis, a region in the state of Sinaloa that has been severely affected by cartel violence. “Part of this project deals with, I will not say make the change, but give the tools to make a change by civilians who deal with everyday violence,” said Sánchez. And Sánchez hopes the project can open dialogues and expand, even to the U.S.-Mexico border.